Developer: EIE International Corporation and William Zeckendorf Jr.
As a major luxury hotel project being launched during one of New York City's worst depressions, this development was eagerly anticipated because of the international renown of the Regent Hotel chain and the mighty reputation of its architect I. M. Pei. The Regent Hotel in Hong Kong is generally regarded as one of the world's greatest and most deluxe hotels where its main competitor is the Peninsula Hotel, which happened to open its first New York hotel, with the same name, a few years earlier in the reconstruction of the former Gotham Hotel three blocks away on Fifth Avenue and 55th Street. Pei, who lives in a townhouse on Sutton Place, then had three Manhattan projects - the black reflective-glass 499 Park Avenue (see The City Review article), a white office building at 88 Pine Street, and a new wing at Mt. Sinai Hospital on Fifth Avenue and 100th Street - that were not milestones in his career or on the city's skyline. 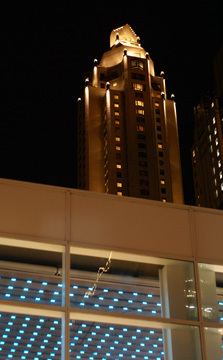 The Regent Hotel chain encountered financial difficulties, withdrew from the project before its completion and was replaced by the Four Seasons chain, the premier corporate luxury hotel chain in North America and the operator of the Pierre Hotel on Fifth Avenue and 61st Street (see The City Review article). Pei, whose greatest designs are the highly abstract and modern East Wing of the National Gallery in Washington, D.C., the "pyramid" at the Louvre Museum in Paris, and the prismatic, high-tech tower for the Bank of China in Hong Kong, came up, surprisingly, with a Post-Modern design for this project. According to Charles V. Bagli, who described the Four Seasons hotel in a March 21, 1994 article in The New York Observer as a "gigantic Temple of Dendur," a reference to the rather prosaic Egyptian temple at the Metropolitan Museum of Art, Pei "insisted on dressing the building in the same French limestone used in the architect's addition to the Museum in Paris." 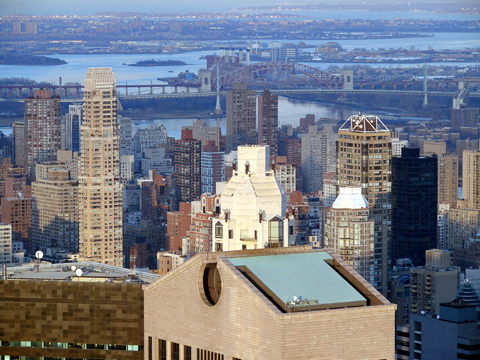 Despite such uncertain beginnings, this cream-colored building, clad in French sandstone and built at a reported cost of more than $475 million, has not disappointed, introducing a new standard of excellence for the well-heeled traveler to New York and providing the city with a new skyscraper landmark that is distinguished, if not great. The building's setback massing on its relatively narrow through-block site is finely proportioned, as can be seen in the photograph below, and literally highlighted with very handsome lanterns on its setbacks, as can be seen in the photograph above. At night, the lanterns are extremely effective and sometimes give the illusion of a rocket adjusting its small thrusters as it soars aloft. The mood created in its public spaces is cool and bright with lavish but subdued appointments in the best of minimalist modernism. Apart from the very attractive setback lanterns, the only major flourish is a fan-shaped canopy fashioned somewhat after Parisian Art Nouveau models. A project this size, however, can do with only so much understatement and its very large main lobby, shown above, with translucent ceiling and large balcony lounges on its east and west sides is impressively awesome in the best traditions of grand hotels for "power" people. A very attractive cocktail lounge on the second floor above the 58th Street entrance is a very delightful space that recalls the former grandeur of the wonderful King Cole Room at the St. Regis Hotel on Fifth Avenue and 56th Street. 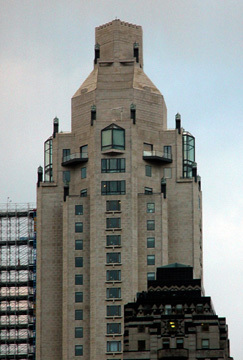 The 367-room, 54-story Four Seasons Hotel's 57th Street entrance, shown below, bears a slight resemblance to Johnson/Burgee's treatment of the pink-granite base of the Sony Building on Madison Avenue between 55th and 56th Streets, particularly in its employment of a large oculus as an isolated design element. The north and south facades of the Sony Building, which originally was the A. T. & T. Building, each have three oculi, whose openings, unfortunately, have been closed by Sony. Far more critical, however, is the relationship of the Four Seasons Hotel with the Fuller Building, the superb Art Deco skyscraper that is its immediate neighbor to the west on the block. Although the Four Seasons tower sets back considerably, it overwhelms its important neighbor that had stood in splendid isolation for decades. A squatter profile, however, would have drastically reduced the number of guest rooms with spectacular views and therefore most likely made the project uneconomic. Furthermore, it would have robbed the skyline of an important new component and removed a major enhancement to the 57th Street ambiance. Indeed, its arrival has greatly reinforced and bolstered the street's prestigious reputation as the upscale center of the world.